Cleansing waters are very popular in France with brands such as Caudalie and the cult Bioderma leading the way. French women are known for their perfect skin so, figuring that they might be onto something, I decided to give Lierac's version a go. 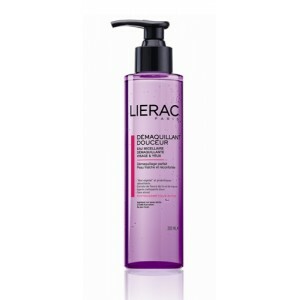 Lierac Demaquillant Douceur is a micellar cleansing water which,simply put, means that it contains oil molecules suspended in soft water. So, what did I think? I liked the bold purple colour of the slimline 200ml bottle and the functionality of the pump dispenser, which makes it easy and mess-free to use. One or two pumps sufficiently saturate a cotton pad, although you may need to use a few if you wear full makeup. Even so, I found that the bottle lasts a relatively long time. To use, you simply swipe the saturated cotton pad over your face. It's a good choice for those with sensitive skin and as there's no rinsing, oily and dry skins alike aren't irritated and balance is improved. You can even use it to remove eye makeup (which it does reasonably effectively on light makeup, plus it contains vitamins which are said to promote eyelash growth). Lierac Demaquillant Douceur has a pleasant, yet not overwhelming floral fragrance and feels fresh to use. For me, I really feel that the success lies in its simplicity- it's a quick and easy way to cleanse effectively so there's a good return on very little commitment. Because of this, I kept up with it. The only thing which I didn't like was the slightly sticky feeling from the residue which is left on the skin, although this goes when you follow with moisturiser. I suspect that this residue is from the added skin-softening ingredients such as glycerin, honey and mallow as well as detoxifying probiotics so the trade off is worthwhile, even if you don't moisturise. At approx £15, this is worth a look if you want to try a cleansing water. I followed with a sweep of the complementary vitamin enriched toning lotion, Tonique Eclat, across my face which helps to remove the final traces of makeup.I was pleased to note that both the cleansing water and the toner are alcohol free which was a big plus point. It's certainly not essential to follow with this step but the toner is pleasant to use with a tempting orange fragrance and I liked that you can even use it on the eyes.